There's no love or loyalty more pure and unwavering than that of dogs toward their humans. But sadly, not every pet owner is so deserving. Kimberly Ann Howell, of Salisbury, North Carolina, was arrested this week for a callous act of animal cruelty against none other than her own furry family member. 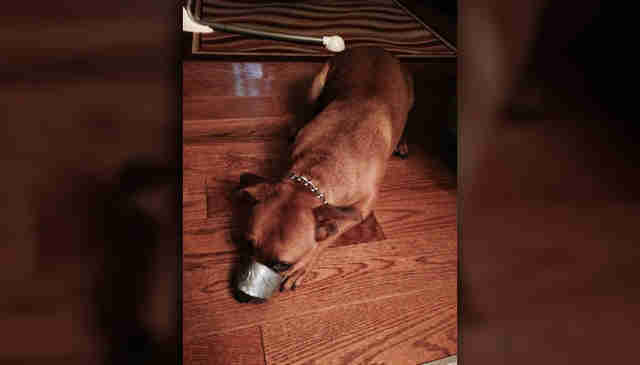 Authorities were alerted to the crime after Howell posted photos on Facebook showing the dog, named Leah, with her muzzle sealed shut with duct tape. In the post, which has since been removed, Howell seemed to take pleasure in Leah's discomfort, captioning one of the photos "Ha ha." An investigator from the Rowland Country Sheriff's Office was dispatched to Howell's home, where she told them that she taped Leah's mouth shut for just a few minutes to keep her from barking, adding that it was not "a big deal." 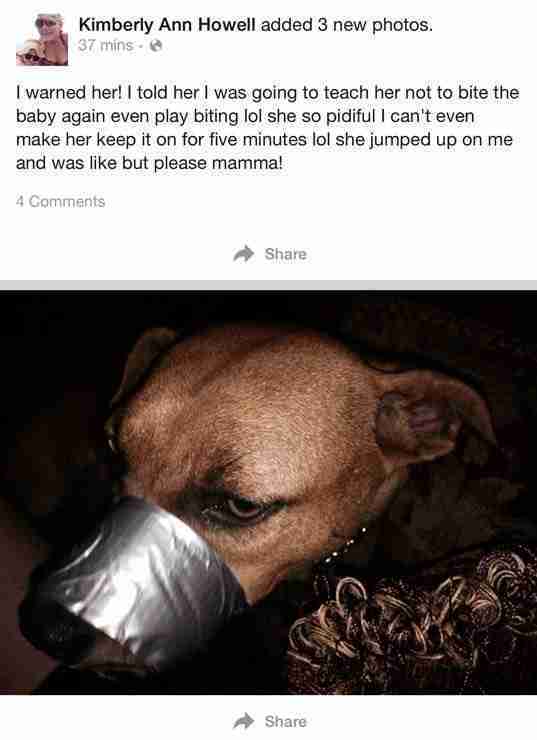 Her reasoning contradicts what she had written on Facebook, a screenshot that was obtained by WBTV News, indicating the dog had been "play biting lol." Authorities, thankfully, disagreed with Howell's lighthearted assessment. 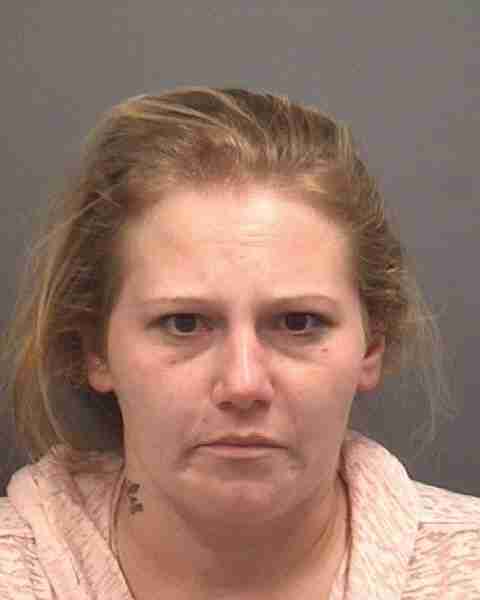 She was booked on cruelty charges, as well as failure to appear in court for an earlier, unrelated charge. Howell was released from jail after posting bond. 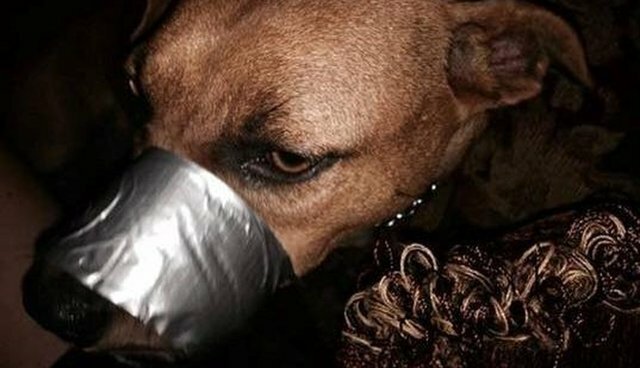 Shortly after, she took to Facebook again to say that she had taped up Leah's muzzle as a "joke," and that people labeling her as an animal abuser had it all wrong. She even suggests that, due to all the outrage surrounding her crime, she is the real victim. "I'm just almost at the point in tears that people are so mean. And I respect that people are serious about animal abuse, they should be," she wrote, as quoted by WBTV. "But I would never abuse my dog. Sad part is people who have never met us are saying different but my dog as happy and playful as can be. I never dreamed human beings could be so cruel and put people they have never met down." Finding no overt signs of neglect or mistreatment, beyond what was seen in the photos, authorities decided to let Howell stay with Leah, despite public calls to have the dog rescued. This case comes just months after several other high-profile instances of dogs having their mouths taped shut in what, sadly, appears to be a disturbing new trend. If you suspect an animal is being abused, take action. Visit the Humane Society of the United States's website for tips on what you can do to help.